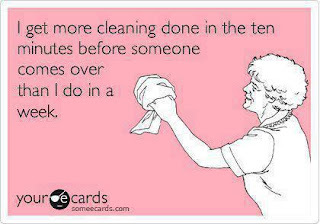 I don't clean very often. I admit it, and everyone who's ever been to my place agrees. It's just not one of my top priorities. Besides, I'm the one who has to live in it, and I'm the only one who's bothered by it, so it's not such a big deal. I don't like hoovering, mostly because there's usually so much stuff lying around on the floor that I'd have to start by sorting that out. I absolutely hate dusting, mainly for the same reason - it's just too much trouble to move everything around in order to get to the dust. Besides, I used to dust off my shelves once a week, but soon I noticed that they still looked as bad as always, because it's such a small apartment and dust accumulates really quickly, so I gave up (which of course is a solution to the problem, unlike, say, dusting a bit more often). I know all this dust is probably the reason my nose is always, always running, and it'll probably end up giving me asthma. It's also a bit disgusting. But yesterday when I got home, something happened that gave me a bit more inspiration to clean, but which was hilarious at the same time. When I'd gone out, I had left my window open, so there was a slight breeze. When I got back and opened the front door, the draught caused a huge dust bunny (ironically enough they're called poodles in Finnish) to glide across the floor to meet me, just like a dog coming to meet its owner! I thought I'd die from laughing so hard! I know, it's disgusting, but definitely hilairous as well! I always say that one day when I get home, the dishes I've left in the sink for ages will meet me at the door, and clearly, I wasn't too far off!